AECm designed a new campus-wide energy controls and monitoring system into the ROC at the PNSY with the objective of significantly reduce energy consumption. Our design includes the integration of existing and new HVAC control systems into a new wireless networked Industrial Control System (ICS) for remote control, monitoring, energy trending, and systems optimization from the high-security ROC center. The ICS will support NAVFAC initiatives to reduce energy consumption in accordance with EISA 2007 requirements. The ICS system networks over 60 buildings throughout the shipyard with existing and new Direct Digital Control (DDC) systems for monitoring and control of HVAC systems. Buildings with existing controls are upgraded for integration with the new controls system and software. The project involves implementing a new ICS utilizing the Niagara Tridium software platform and integrating the systems with existing supervisory controls (SCADA) and advanced metering systems (AMI) for electricity, water, sanitary, and steam. AECm designed a new Graphical User Interface (GUI) and staffed monitoring station located within the high-secure ROC facility. 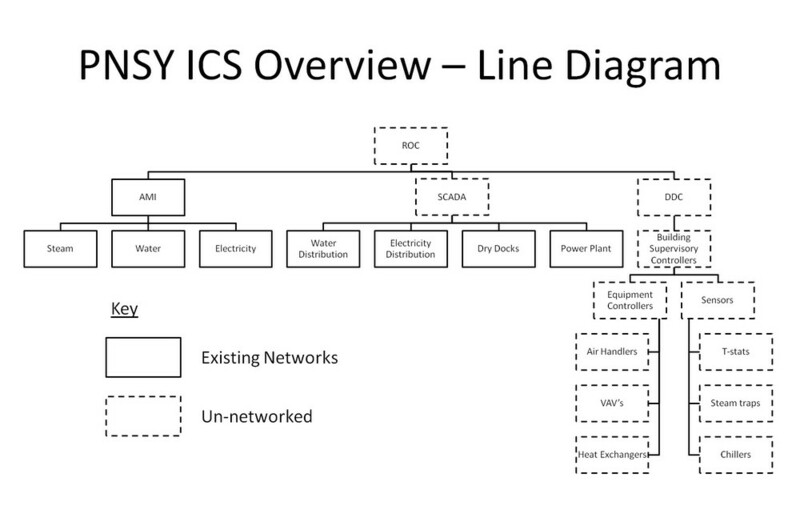 This ICS system was designed to establish a standard for energy control systems at all NAVFAC MIDLANT facilities. The R22 project is intended to reduce total energy consumption in over 30 buildings at the Portsmouth Naval Shipyard (PNSY) by replacing inefficient R-22 refrigerant equipment with modern equipment containing R-410a refrigerant. This project was also initiated to remove ozone depleting refrigerants in accordance with the USEPA Clean Air Act. Buildings within the scope of this project without existing Direct Digital Control (DDC) systems will have new systems installed to monitor and control HVAC equipment. Those buildings with existing controls will be upgraded for integration with the new controls system. The buildings will be integrated into the ROC ICS for remote monitoring and control. The Building 86/86A and Building 13 retrocommissioning projects involved optimizing and replacing existing HVAC systems with modern, energy efficient equipment and systems. This included new chiller units (up to 80 tons), air handling units, energy recovery ventilators, DX units, and air-source heat pump systems. Existing steam and chiller distribution systems were improved with additional equipment and controls for improved zoning and occupant comfort. AECm also designed the HVAC controls integration of these buildings with the new ROC ICS. To establish baseline knowledge of existing buildings, facilities, and operations, AECm and its team completed an extensive assessment of relevant archive data for validation. Physical surveys of buildings, facilities, infrastructure, and systems were completed to resolve data gaps throughout the PNSY campus. This intensive process spanned a period of six months included a review of the following: record drawings, reports, studies, design documents, equipment inventory logs, physical surveys, and interviews.